We come together to explore deep connection to nature, self and others. This is a weekend of nourishment, exploration and compassion lead by Gaylyn Kaufman, Deanne Bednar & Corinne Denomme on the beautiful land at Strawbale Studio. How do we care for ourselves as women? How do we renew so we can engage with our best selves and our gifts to Life ? We will be immersing ourselves in nature, exploring through our senses, opening our hearts to compassion for self and others, slowing down, learning to listen more closely, connecting and sharing the magical, beautiful space together. Together we will drop into Beingness, in this natural, nurturing setting … into quiet, joyful mind. Reserve this weekend on the calendar for you! $120 – $150 sliding scale. There are 13 places to sleep in the house on single or double beds, futons and comfy couches plus 2 cots. First register, first choices of sleeping arrangements after you arrive. Let us know if you have special needs. Camping $15 discount. Bring your own equipment. Share our facebook Link ! Always an Elder in training, a lover by nature! Passionate about the profound connection available through awakening the senses in nature, deep listening & mentoring. Loves helping others discover personal gift’s. Champions multi-generational support and interaction. Bachelor in Human Relations, Conscious Aging facilitator, student of 8 Shields deep nature connection organization/movement! Background in healthy lifestyle change. Experienced in art, joy, celebration and ceremony. Embraced continuum parenting and has three adult sons who were home-schooled. Actively pursues community co-creation and intentional culture to create the beautiful world we know is possible. Committed that re-establishing relationship with Nature is the key. 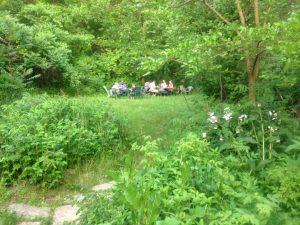 Corinne is a self-taught folk herbalist, conscious wildcrafter, rewilding enthusiast, and nature mentor at Hawthorn Wilderness Connection. With a collection of varying trades she embodies an autodidactic lifestyle of Do-It-Yourself, ranging from a tiny cabin project to creating small batch herbal offerings under White Pine Rising. Corinne’s an avid forest dweller who spends much of her time reconnecting and relearning directly from the land. She believes the symbiotic relationships observed in the wild can inspire each of us to appreciate a fulfilling life garnished with great respect and nurturing that enriches our own relationships to self and others. She is passionate about the power of community, healing cultural wounds, and inspiring others to see their own inner gifts. 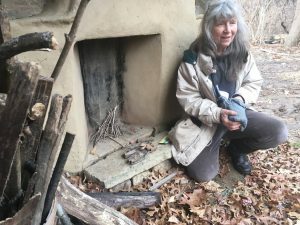 Deanne has been doing natural building since 1996, and is the coordinator of the Strawbale Studio Natural Building & Sustainable Living Skills program, as well as the illustrator of 3 books on natural building. Her background is art & sustainability teacher at the middle school level, with a Masters in Social Ecology. She studies/practices Compassionate Communication as a way to interface with people and issues. Deanne loves foraging, making things from natural materials, whittling, fermenting, music, creativity, permaculture & play. Women can be the change we wish to see by strengthening our connection to nature, ourselves and each other!